Go Ahead traveler Jack has been to all seven continents and over 150 countries, but he was still able to uncover a whole new destination on his recent Go Ahead adventure. In fact, he went on two consecutive tours: Amsterdam, Luxembourg, & Brussels and Portugal: Porto, the Algarve & Lisbon. 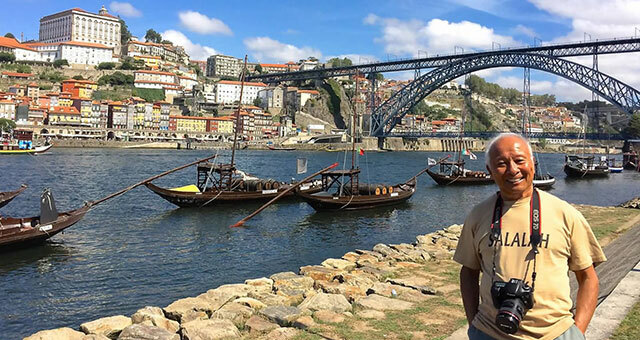 Here, he talks about customizing his travel experience and visiting Porto for the first time, and explains why traveling on guided tours with Go Ahead is the best way to see the world for even the most experienced travelers. Out of the ordinary. A couple of my favorite adventures have been in Antarctica and on African safaris, and Asia is very dear to me. I love learning about different cultures and having new experiences. I like to do three- to six-week trips and the schedule was perfect. Plus, it was my first time visiting Porto, Portugal. I was able to fly directly there and have free time in Lisbon at the end of the tour. Very colorful. I was able to see Portuguese history in the blue tiles and visit the book store where author JK Rowing spent many hours. Plus, I enjoyed great seafood and wines and climbed to the top of Clerigos Tower. Standing in line and maximizes major highlights so you can cover more area in a limited amount of time. Also, the Tour Directors’ historical narrative is very helpful, and you can always find free time to explore on your own. For me, a guided tour is the best, but I always set aside a couple of days either pre- or post-tour to explore. How have you personalized your own travel experiences with excursions, extensions, and more? Tell us in the comments below!